It's been a rough few days. D wise. We Had TWO birthday parties on Sunday. And she was HIGH. As in HI! I hate it when the meter greets you that way. New pod because I accidentally took the old one off trying to take of something else... Changed bed sheets and nightclothes around 11pm. Soaked. She came down overnight. But she was high as a kite most of the day. Corrections didn't seem to touch it. Number down to do massive rage bolusing. New pod just as a precaution. We're all tired here. Tired of fighting this fight. Whether it be on the sidelines or as the actual fighter. But that's not the only reason it's been a rough go of it. You know what that means. It means another life was cut short due to type 1 diabetes. But sometimes I just can't go there. I see the candles.... I say prayers for the child and the family. But I really try to not dwell on it. I try to not find out exactly what happened. I try to put up a wall... and not let it into to my life. Or my heart. I mean, it's not that I don't know it can happen. I know. It's more like sometimes when I see the candles I can feel myself putting on my armor so it doesn't get to me. Because sometimes I just know if I'm not strong enough to handle it. This time I didn't get the armor on fast enough, I guess. And this one is haunting me. This one is really getting to me. This one... this one hit way too close to home. I'm not going to use any names. I don't know this family. I don't know what happened. I only know what I read on facebook from posts. I don't claim to have totally accurate or correct information. But what I read was that a 14 year old girl passed away after a low blood sugar and a seizure at night. She was unable to be revived. I kid you not. If I had been standing up when I read this, I would have fallen to my knees. I felt this wave of sheer terror wash over me... And this overwhelming feeling of grief. I am so incredibly heartbroken for this family. I'm not sure I have the words to convey this... We who live this crazy D life are a family. None of us asked for this... But here we are. And the truth is, this could have been any of us. But for me... for us... I had a flashback. I remember so clearly that night in April when Sweets blood sugar crashed and the meter read LO and she seized. I remember holding her on the floor in the upstairs hallway. I remember calling 911 and begging them to please hurry. I remember praying to God to please, please don't take my baby. Why wasn't it us? Why was it this girl? What happened that one child survived and one did not? What if our luck runs out? There is always that fear. That little bit of fear that is a slight undercurrent to our lives. Sometimes we feel it's pull stronger than others. I feel that this is a rambling post... but that is just where I am tonight. All over the place. And hurting. Hurting for my child. Hurting for myself. Hurting for all us. But mostly, hurting for this family that I've never met... this family who lives across the country... who is living my worst nightmare. That's really all I've got. We can LIVE LIFE. And we can live it WELL. We can refuse to let the fear paralyze us. We can continue to defy the odds. We can continue to raise money. We can continue to advocate. We can continue to support and love each other. And we can promise that we will never forget. We will never forget the reason why we do all this. As our walk is approaching this weekend, I find that my resolve is strengthened. And I know that I do what I do not only for my child. But for yours. And for those who are no longer able. Oh Hallie, you always seem to blog exactly what my heart is feeling....(hugs) you aren't alone in hiding, right now I'm right there with you! beautiful and straight from your heart Hallie. 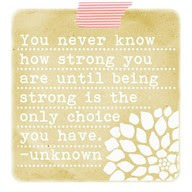 That is one of my favorite quotes about not knowing how strong you really are. HUGS to you and I am getting a huge same same feeling from this post. Beautiful post Hallie! While I do think the blue candles are a beautiful sentiment to acknowledge a life lost to T1, I sometimes have to force myself to step back and not search for all the why's too! But sometimes they just hit a little too close for comfort and I feel too connected not to learn more. I think the best we can do is continue to move forward and live life like you said. I hope you and your family have a great walk this weekend and feel the love and support all around! I too have been reading about this on facebook as well. My heart is heavy for this family as this is my worst fear ever with my daughter. We have never been that low our lowest was 32 and I just about lost it. Praying along with you that there is a cure someday. If I knew you, I'd hug you. Your words express what so many of us struggle with, live with, and reluctantly accept on a daily basis. Reality is a kicker, isn't it? Same same. Hugs to you my friend. One of the many benefits to not being on FB... I never see or hear about the blue candles unless it gets mentioned on a blog. I'm like you, I don't really want to know. The reality hits a little too close to home. I hear you! It is so hard to read about this, unfortunately over and over again. You said it in the perfect way - it is in NO WAY, shape or form that I don't care. I care too much and I can't get it out of my head. It is way too close to home! My heart is breaking for this family that has lost their daughter. I know how you feel. Sometimes I wonder if it's bad to hear about those candles because of how depressed I get about myself. I know EXACTLY what you mean about having to remove yourself from the pain of the blue candles at times. That's where I am at right now. I'm not strong enough right now to let the reality sink in and frankly, I don't think it is good for any of us to dwell on that pain and all the "what ifs". One step at a time, one day at a time, and focus on the cure that WILL be here someday. On that day, we can all take a collective sigh of relief.